From director Nathan Juran comes this less than stellar Noir effort from writer-producer Roger Corman but it’s one that has a major plus when the blood has stopped flowing and the .45 automatic has no bullets left in the clip. That would be lead actor and Noir poster boy Richard Conte. It’s an Allied Artists release that finds Conte in top form as a Korean war veteran just out of the service and hitting the bars and clubs in Las Vegas. The footage of Vegas in 1954 in itself is perfect nostalgia fodder. Conte saddles a barstool next to an icy blonde (Mary Beth Hughes) who proves volatile when drinking. A skirmish ensues in the casino and next morning we see Conte hitchhiking outside of town. Not for long when Reed Hadley of the local police force plays hardball and has him arrested. Our icy blonde with two many drinks in her system has been murdered and Conte is the clear cut winner in the suspect department. He was seen with her, he argued with her and a piece of his personal property has been found in the same room as the body. When his alibi proves to be flimsy, Conte realizes he’s about to be fast tracked to death row and knowing how to handle himself, uses some of his army training to overtake three officers and walk off with his army issued .45 tucked inside his belt. Just like Bogie would have done it. 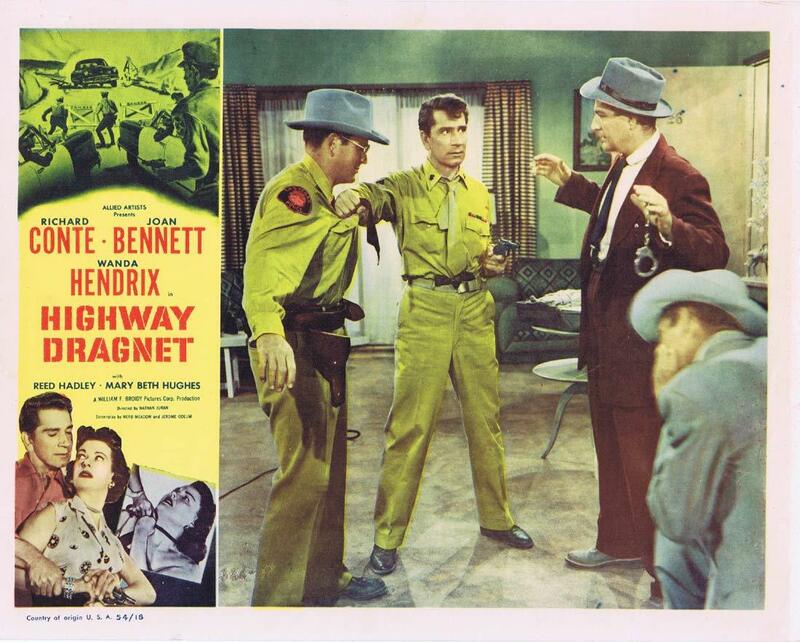 Making his getaway in a cop car he quickly ditches it in the Nevada desert outside of Vegas and comes across a pair of stranded ladies with a broken down car played by Joan Bennett and Wanda Hendrix. No sooner does he meet them by pure chance and the wheels start to come off what seemed like a decent entry in the pool of Noir titles one can choose from looking back to the genre’s classic days. Yup it took me all of three seconds to guess who the real killer was from here forward. 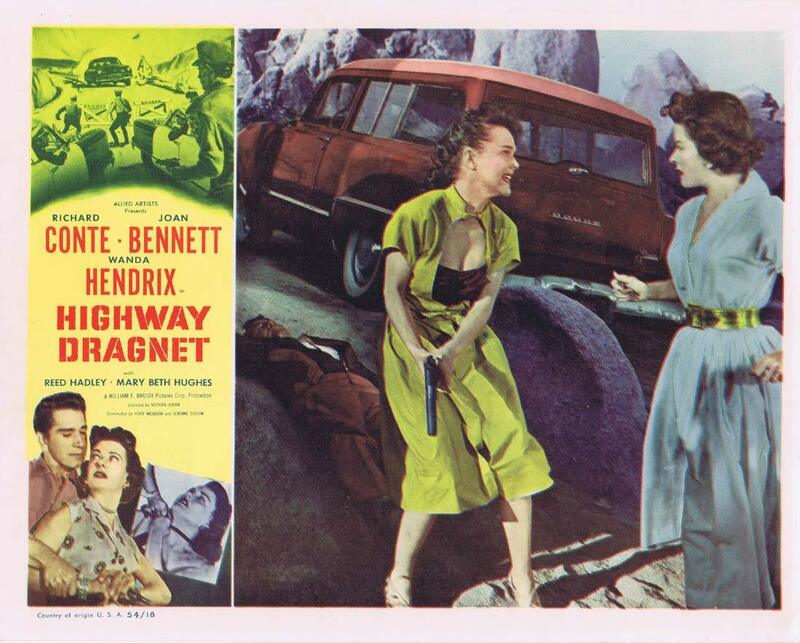 For the balance of the film, Conte is on the run with both dames serving as his hostages. One of which, Miss Bennett is downright nuts while Hendrix is downright nutty for falling in love with the so called “strap killer” holding her at gunpoint and 18 years her senior. Comically my wife happened into the movie room over the final half hour of this not so epic man on the run with a couple of nutty dames Noir effort and I can’t exactly blame her for thinking it was a total loss of seventy minutes of my life that can’t be reclaimed. I tried to explain to her that Conte himself was in top form here so NO IT WASN’T. The man looks so at home in these crime capers that all is forgiven. It’s a job and he did it extremely well considering the material. Miss Bennett however doesn’t fare so well. Her role and sadly her performance is quite embarrassing. Again maybe all should be forgiven. It was her first acting appearance since 1951 and maybe it’s all that was available at the time. She’d find better luck in the year ahead appearing opposite Bogie in We’re No Angels for Michael Curtiz. Wanda Hendrix was also nearing the end of her run of movies that cast her as the young lady awaiting her leading man to sweep her up in the happy ever after fadeout. No matter how improbable the situation. 1954 would see her in a couple films and aside from TV work from 1957 onward, she wouldn’t appear in a movie till 1961 titled The Boy Who Caught a Crook. While he didn’t direct it, it was written by Highway Dragnet’s director Juran. While I’ll admit to being a tad harsh here overall, when looking at the list of titles directed by Juran, I’d probably sit in and watch most any one of them all over again. Some of his many titles include, The Deadly Mantis, The Black Castle, Tumbleweeds, 20 Million Miles to Earth, First Men In The Moon and the first Harryhausen-Sinbad feature, The 7th Voyage of Sinbad. Those with a keen eye on the credits might have noticed the assistant director credit went to William Beaudine Jr. Yes that’s the offspring of the infamous William “One Shot” Beaudine. The man who gave us so many Monogram classics and beyond culminating in the John Carradine embarrassment, Billy the Kid Vs. Dracula. Can’t help but wonder if Dear Old Dad’s career held Jr.’s back. Looking for the positive as always, I’m glad that Kino Lorber picked this relatively obscure title up for a blu ray release allowing me the opportunity to see another Richard Conte title from his younger years before he drifted overseas to Italian crime capers and of course playing Barzini in The Godfather. Juran made dome highly entertaining movies and the casting of Bennett and Conte automatically gets may attention. All this means I’ve had the film on my radar since I heard of its release. However, I’m a little disappointed to hear it’s not all it might have been, especially the weak part for Bennett. I think I still want to give it a go but I can see myself holding out till it shows up in a sale somewhere. 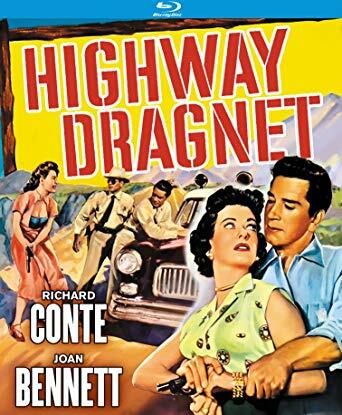 It pretty much telegraphs the whole plot from the moment the ladies arrive and Bennett sadly comes off as embarrassing I thought but Conte delivers. Worth a look but as you say, when the price is right. Super write up and it’s good to see obscure flicks like this get the high-def treatment. I get the feeling that I enjoyed this one better than you did,Mike. Also like lots of Juran’s output DRUMS ACROSS THE RIVER being a personal fave. treatment. Always enjoy Reed Hadley,especially as a cop. Not that I didn’t enjoy it exactly, Just thought the whole thing was rather lame with Bennett and far too convenient. Hadley does have a firm authoritative presence in these roles. For me the attraction is Conte. Always been a fan. This is a poor film, but has a certain appeal. It begins to become absurd when the car breaks down in the desert, and the ending gives the impression that the production budget had run out. 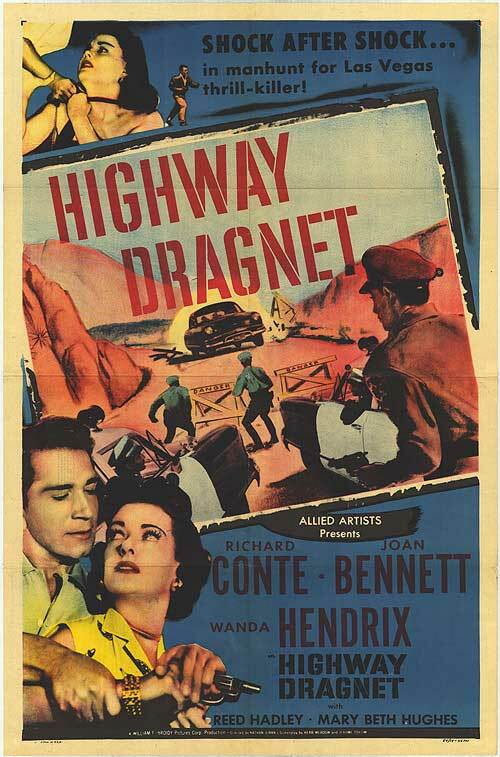 Richard Conte excels when given suitable material, but even here, he gives a most effective performance. 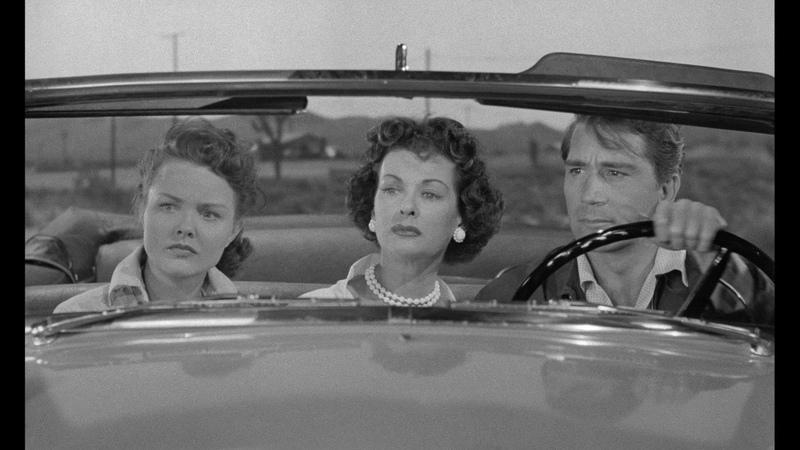 (He carries an excellent film: ‘House Of Strangers’ – carries it even with Edward G. Robinson and Susan Hayward. He does as well in: ‘The Blue Gardenia’.) Joan Bennett, always captivating, is wasted here. I like her restraint, her elegance, and her beautiful speaking voice. You must see her in: ‘The Macomber Affair’. Here, Gregory Peck is a perfect foil for her, and I do think she ought to have received an Oscar for her performance. She displays her versatility in: ‘The Reckless Moment’, and: ‘There’s Always Tomorrow’. Conte is really the only reason to check it out for my money. Guy was so well suited to this kind of thing.